Rhenowave® inline process control safeguards quality during rubber processing. 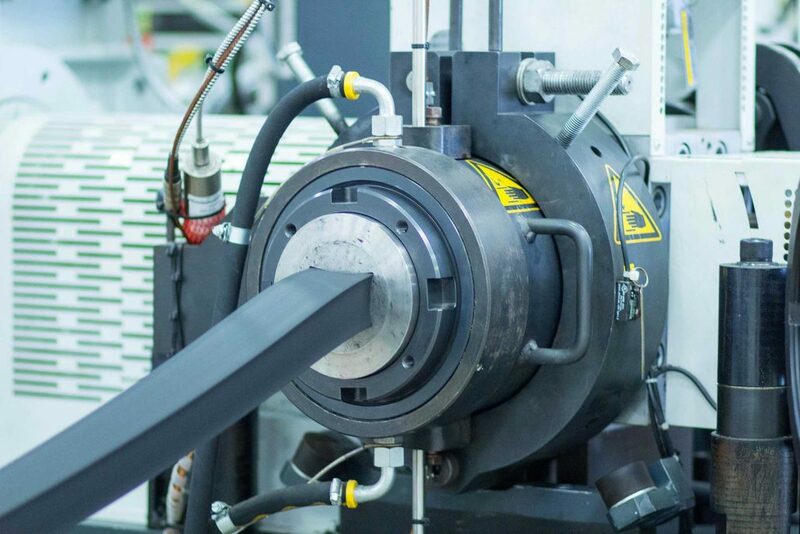 Whether it’s a matter of tires or technical rubber goods, LANXESS is setting new standards in the industrial manufacturing of rubber products with Rhenowave® inline process control. The reason: Thanks to Rhenowave®, it is now possible for manufacturers to monitor their rubber compounds for possible defects while they are still being produced. 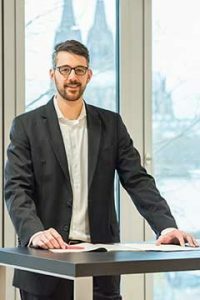 In this interview, Dr. Benjamin Bechem, Marketing Manager New Technologies, and Dr. Dirk Kaempfer, Head of Application Technology, explain how Rhenowave® works, the benefits that it entails, and why Rhenowave® is heralding in a new era of inline process control for rubber compounds. Dr. Bechem, the Rhenowave® technology developed by LANXESS is being hailed as revolutionary in the rubber industry. Why is that? Bechem: Thanks to Rhenowave®, customers can now receive information inline about the quality of their rubber compounds, without any delay. Information like dthe state of the rubber compound’s homogeneity and composition can be reviewed while they are still in production. In the past, this wasn’t possible until after production had finished. This is why we have no hesitation in referring to Rhenowave® as a real milestone. It is an innovative inline process control for use during industrial rubber processing. 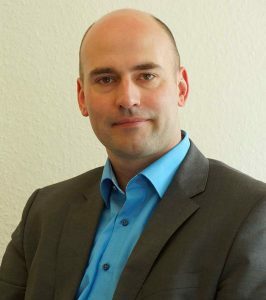 Dr. Kaempfer, you supervised the development of Rhenowave®. How does the technology work? 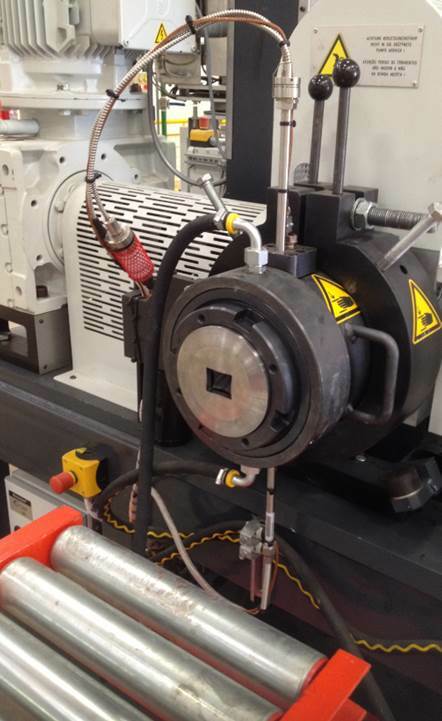 Kaempfer: Rhenowave® is installed on the head of the existing extruder. The measuring unit consists of two ultrasound transducers, a transmitter and a receiver, that the rubber compound flows between. The transmitter creates a consistent ultrasound signal, which travels through the rubber compound to the receiver. Imagine it like this: The intensity of the ultrasound signal is muffled on its way from the transmitter to the receiver. The extent to which the signal strength is reduced is characteristic of the composition of the rubber compound currently in use. How exactly does this manifest itself? Kaempfer: The components of rubber compounds muffle the ultrasound signal at varying strengths. 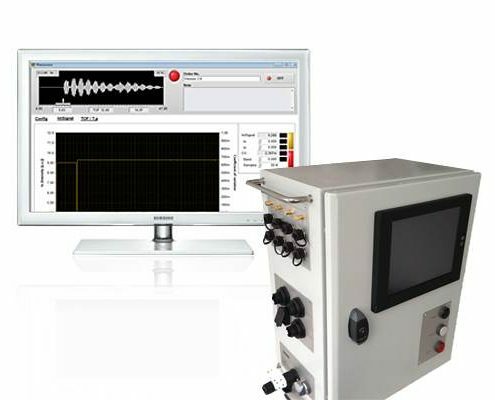 Different components therefore display different ultrasound intensities. For this reason, you also need a reference compound before using Rhenowave® in a new field of application in order to calibrate it and to define a standard, which then makes it possible to identify contamination or concentration discrepancies in the compound components. The customer can review the data collected on the system’s screen and intervene in the process without delay. Does that mean that the customer can continuously control the production process? Kaempfer: Exactly. Rhenowave® generates a signal at least ten times per second. This variety of measurement data allows for continuous inline process control. Does this process adversely affect the compound in any way? Bechem: Absolutely not. That is another one of the advantages of using Rhenowave®: It is non-destructive. Conventional, mechanical testing methods remove and vulcanize a small portion of the natural rubber compound for sampling. For example, they turn it into industrial rubber. This means that the sample can no longer shaped in any other way, or be returned to production after testing. The results of the sample analysis are then applied to the far greater proportion of the rubber compound. Does this mean that the sample that you remove can no longer be used? Bechem: That’s right. As a result, the proportion that can be examined using conventional methods must be very small, otherwise too much material is lost. This just isn’t a problem with Rhenowave®. The material is not destroyed during measurement. Are there any other benefits in comparison with other measurement methods? Bechem: Yes. For example, the data collected is representative of the whole compound. You have to think of it like this,as I already mentioned, usually only a small part of the compound is removed and examined in the laboratory. The average sample size is about 100 grams per 100 kilograms. This information is then applied to the entire compound, which means that defective areas are potentially left undiscovered. 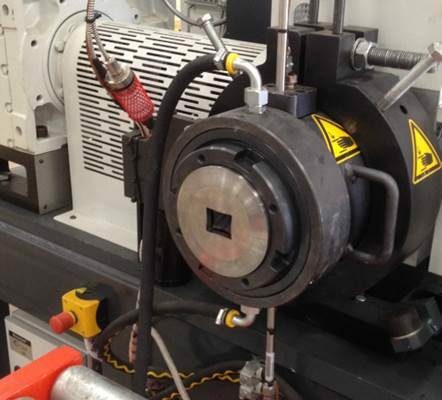 By utilizing the non-destructive Rhenowave® technology and its continuous inline control, customers receive not only information about a small fragment of their compound, but rather about several kilograms or the entire compound. And, this information is available on the spot, not in ten minutes or even days after manufacturing,, which means that intervention in the process can take place immediatelyif defects are detected. Does that mean that there is also less unsaleable waste? Bechem: That’s right. Because, if information showing that the compound does not meet the requirements is not available until much later, , a large volume of waste is produced. However, if, Rhenowave®is employed, just the part of the compound that has been demonstrated to be bad can be removed, thus reducing the amount of waste that is produced. This increase both manufacturing output and the capacity of the plant, providing a temporal and ultimately also a financial advantage. Where can Rhenowave® be used? Bechem: Primarily in places where natural rubber is processed and turned into industrial rubber. All that is required to utilize Rhenowave® is the flow of matter. This is why it can also be used in the laboratory where scientists gather information about the natural rubber compound and use it to optimize the compound. Is the production location a deciding factor when using Rhenowave®? Bechem: No. That’s another benefit, because thanks to Rhenowave®, our customers have more freedom in how they choose to set up their production. 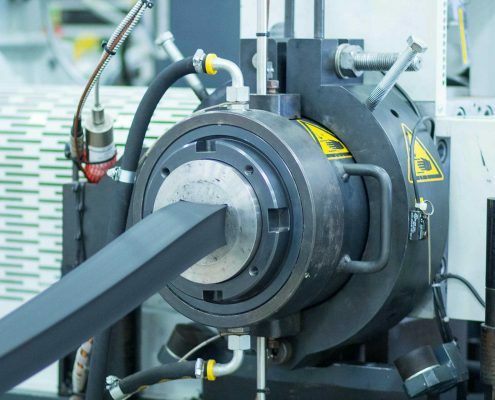 Because information about the rubber compound is saved in a central unit, production can take place all over the world and close to customers, without producers having to reveal any formulation information. Are there limits or can Rhenowave® analyze any kind of rubber compound? Kaempfer: In principle, it can analyze any rubber compound over 100°C. In addition to this, the distance between two sound converters can be flexibly adjusted. This means that manufacturers can analyze different rubber compounds – with a whole range of masses and volumes. Moreover, Rhenowave® also analyzes black compounds. This is important as most compounds are black due to the fact that they contain soot. Visual inline methods such as infrared or UV/VIS spectroscopy are not an alternative in this regard. Immediate process analysis – to which extent does Rhenowave® influence the quality of the products manufactured? Bechem: There are more and more demands being made on product quality, which applies just as much to the rubber industry as it does to others. This has also led to an increase in awareness about quality. This is why a method of representatively analyzing an entire compound is now indispensable for producers. In this way, we have created an entirely new standard of process control. Kaempfer: Let’s think about this a bit more: Up until now, customers have not been calculating the coefficients of variation with regard to their compounds, which is a measurement that allows them to draw conclusions about a compound’s homogeneity. Customers’ customers just haven’t been demanding it. But because Rhenowave® measures representatively, we are now able to introduce this new parameter of quality control, and thus provide the customer with a unique selling point. Given all these benefits, how can customers obtain Rhenowave®? Bechem: Interested companies can come to our laboratory and see how the device works and what it can do. We are happy to use customers’ compounds in these demonstrations so that they can see right away whether Rhenowave® is suited to their purposes. In step two, they rent the device. Bechem: So far customers have been very excited. I recently demonstrated the device at our location in Brazil where we produce the bladders used in tire manufacturing and customers were completely blown away. The routine is always the same: When somebody realizes that they can observe the quality of the compound on the monitor, it just clicks, because it simply wasn’t something that they even thought was possible up until this point. Looking ahead to the future: How important is Rhenowave® for the rubber industry? Kaempfer: The rubber industry has been trying to manufacture its compounds continuously and more cost efficiently for the last 30 years. The problem is: These continuous processes are often a lot more prone to failure than conventional, discontinuous compounding. This is where Rhenowave® comes in, because these defective factors can now be identified right away and eliminated immediately with inline control. This means that manufacturers can guarantee that the product has the right composition at the end. So we’re providing a tool that producers can use to actually reorganize continuous compounding processes.